In small bowl, using wire whisk, mix vinegar, olive oil, salt and pepper. Stir in mint. 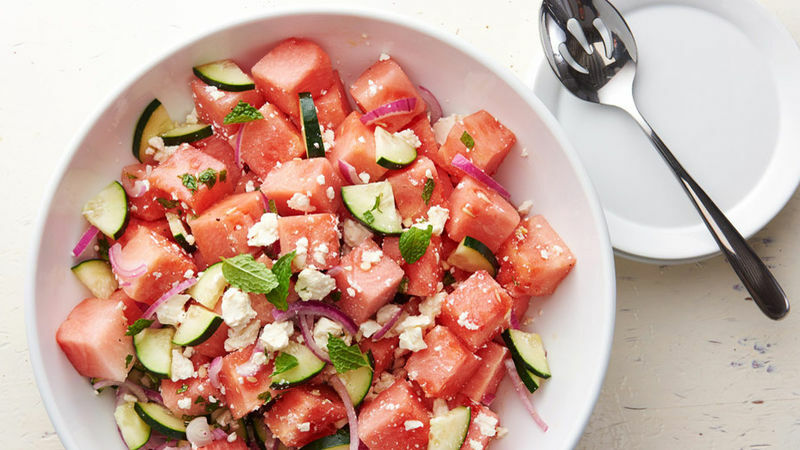 In large bowl, mix watermelon, cucumber, onion and 3/4 cup of the feta cheese. Pour dressing over watermelon mixture; toss gently to combine. Sprinkle salad with remaining feta cheese. Garnish servings with additional mint, if desired. Try adding other additions to your salad, such as blueberries, strawberries or kalamata olives. The salad can be chilled for up to 2 hours. The watermelon keeps releasing its juices so the longer it stands, the more liquid will gather in your bowl.